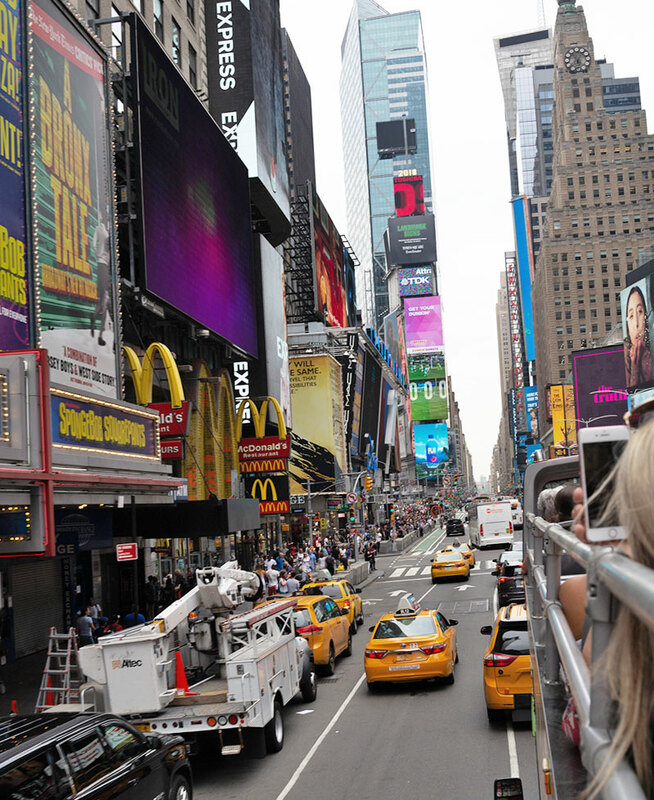 A double decker bus tour with TopView Sightseeing around NYC with stops for tea treats! 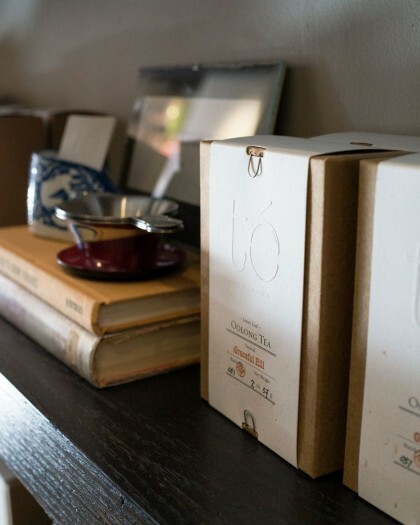 I hop on hop off to some of my favorite tea spots around the city. I’m ALWAYS the designated tour guide when friends or family visit NYC. I don’t mind it one bit since I love being a tourist in my own city. One thing I started doing a few years ago was taking them on double decker bus tours. They’re super fun to ride in and you can see so much of the city at once without tiring out your feet. It’s a good way to figure out where everything is in relation to one another. 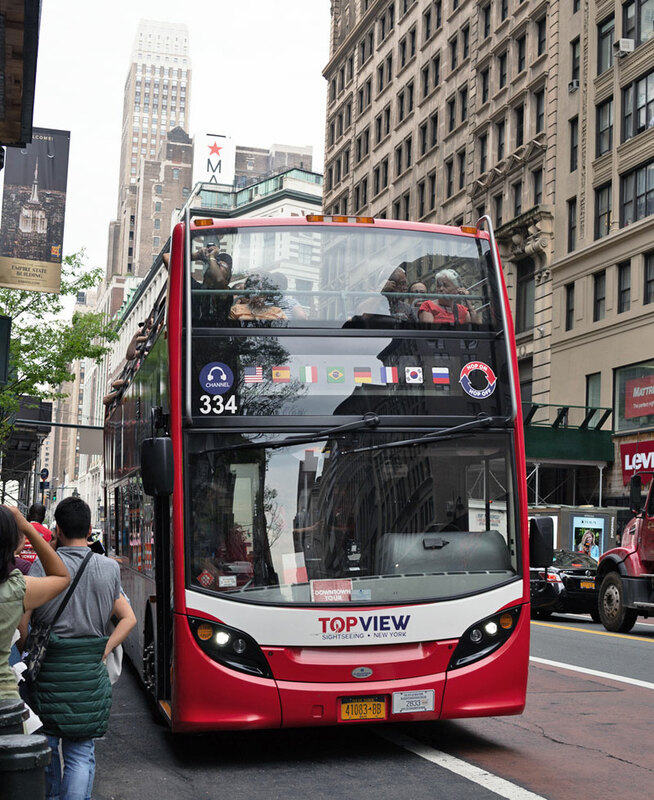 I collaborated with TopView Sightseeing to share with you a fun way to spend a day on a double decker bus seeing the sights and hopping on and off to stop for tea treats. My friend Queenie joined me on this outing and we played tourists together. 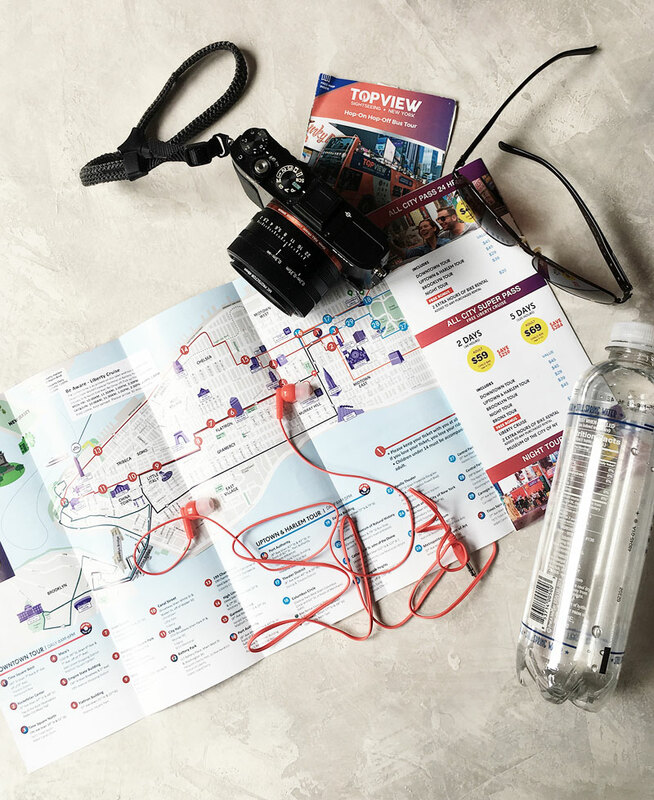 We had our essentials: bottle of water, sunglasses, a camera (like a true tourist), and our map which showed us all the stops. We started at the 46th Street and 8th Ave TopView bus stop in Hell’s Kitchen near Times Square and got on the Downtown Tour bus. It’s the first stop so you’ll most likely get on the first bus that’s parked there. We got seats on the left side of the bus (I think the left side has better views) and away we went! Note that this double decker bus tour doesn’t have a live tour guide. 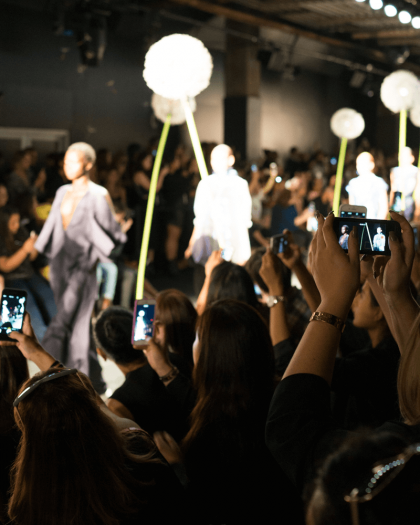 You get a pre-recorded track that gives you little snippets of info. The last time I was on a double decker bus with a different company, the tour guide was so bad and so annoying my cousin and I got off the bus at the next stop just to not listen to him anymore. Anyway, back to our tour. From Hell’s Kitchen, we went through Times Square. 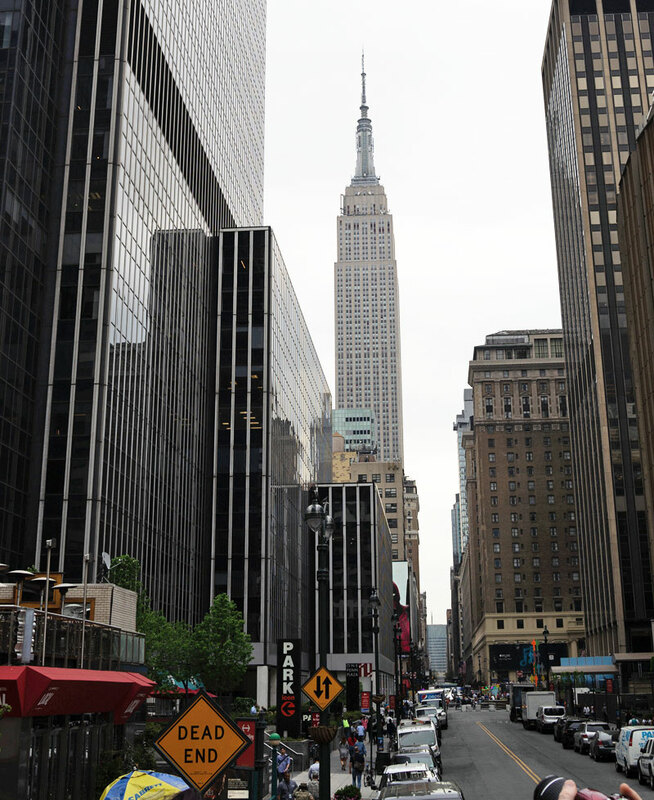 A quick little loop around Madison Square Garden and we were headed to our first stop, Empire State Building. 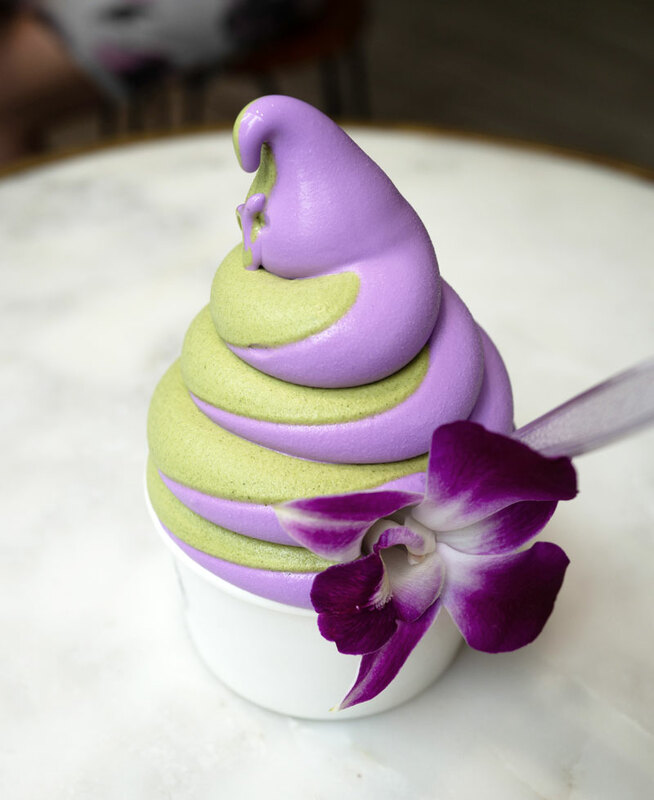 The Empire State Building stop is on 34th Street between 5th and 6th Ave and walk 2 blocks south for this delicious matcha and ube soft serve swirl! 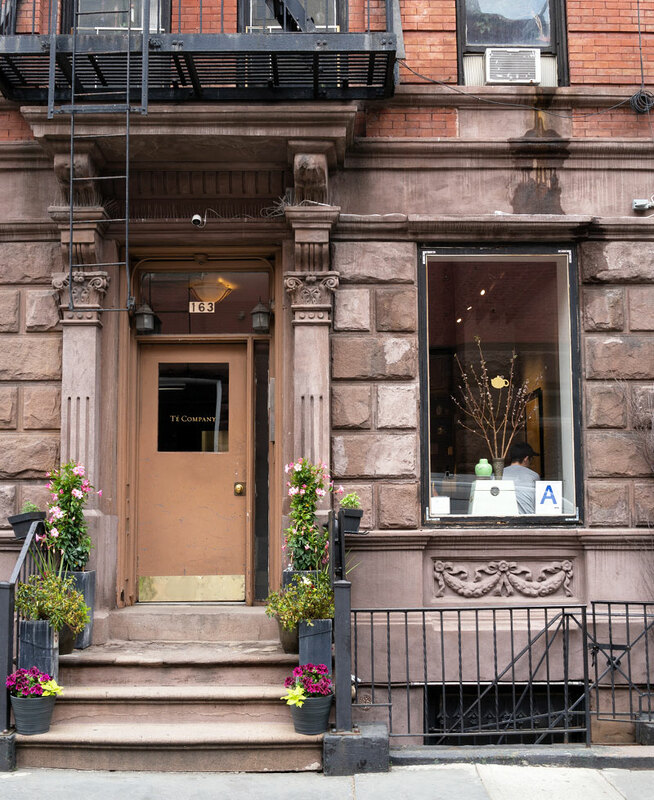 A cafe on the corner of 34th Street and 5th Ave, Besfren serves this Instagram-worthy dessert. Queenie and I shared one since we knew we had more stops to go. Was there a hollow hole in the middle of the swirl? YES. Walking back to the same stop we got off of, I quickly checked the TopView website to see the live map that shows you when the next bus will arrive. I usually don’t take advantage of the hop on hop off on double decker buses since I never know when the next bus is coming. 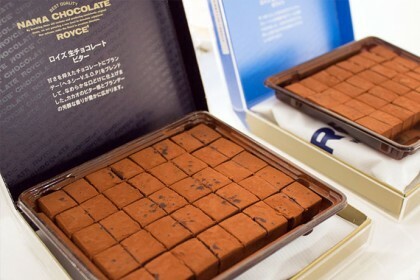 Thankfully, this took the mystery out of having to wait indefinitely! On busy days like Fridays, the bus comes pretty frequently, like every 15 minutes. On less busy days, the live map really comes in hand since it comes every 20-30 minutes. 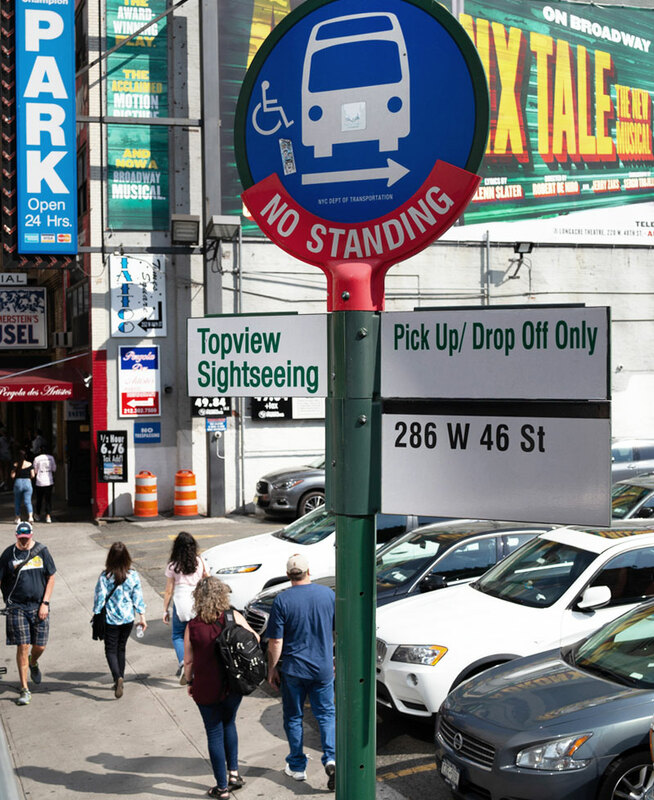 All TopView bus stops are marked with TopView Sightseeing so that helps to figure out whether you’re at the right spot to get on. 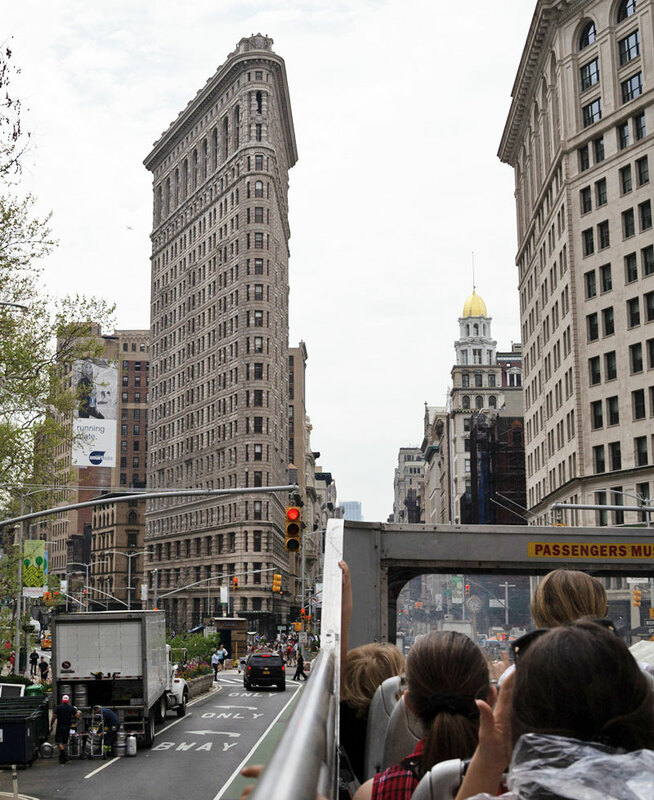 Heading downtown along 5th Ave and we’re riding past the iconic, triangular shaped Flatiron Building. Go further down to our next stop at Washington Square Park. 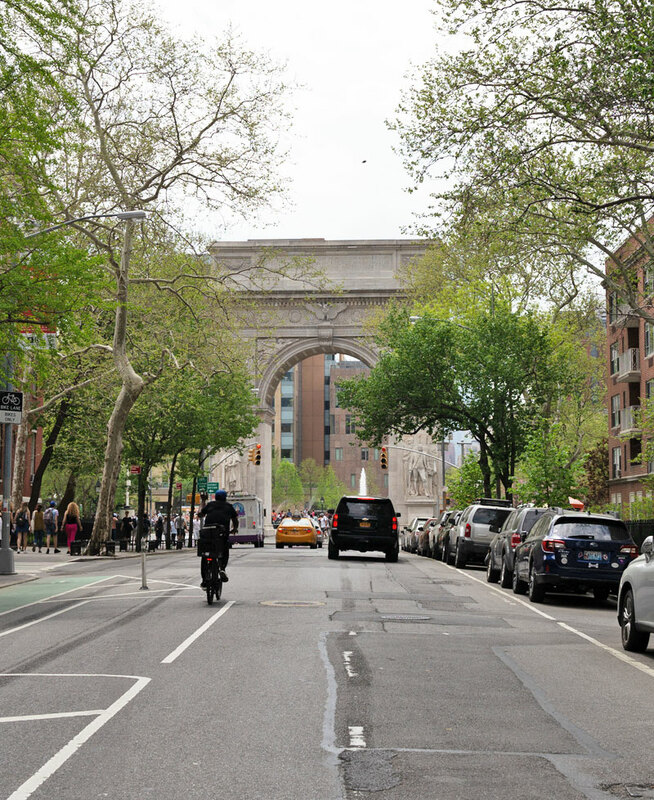 We walked past the Washington Square Arch and we headed to the West Village for a late lunch. Ok, so this stop is a little bit away from the bus stop but I still highly recommend it since it’s my favorite tea spot in NYC. Hello, gorgeous. 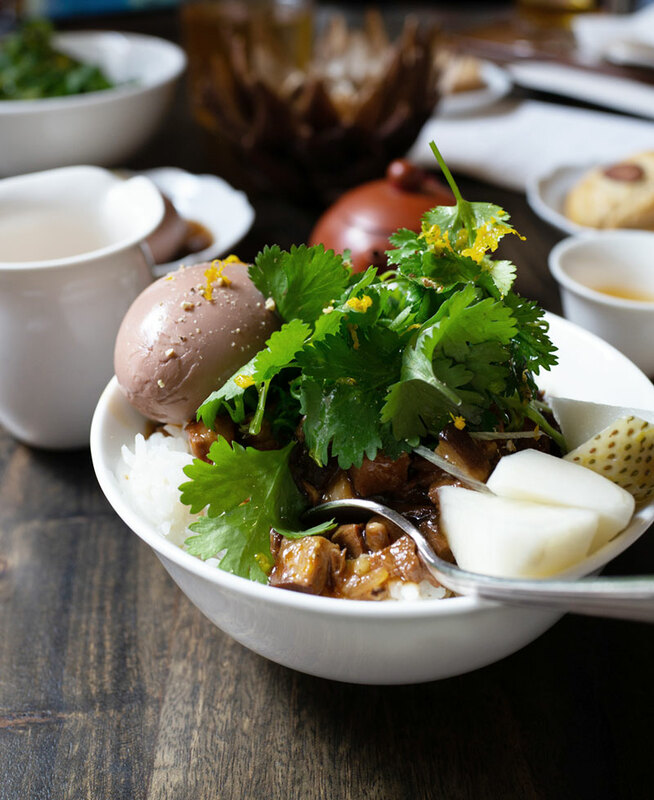 Their pork belly rice bowl with a lovely soft-boiled egg is so good and filling. I ate my rice bowl clean in between sips of their cold brewed oolong tea. 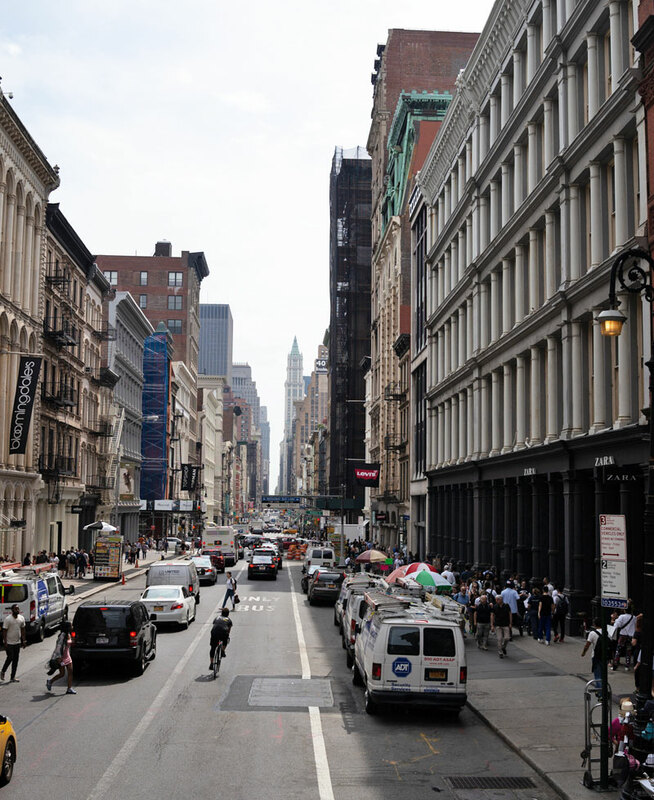 We did a slow stroll through Greenwich Village and got on the next bus. Now we’re off to get more dessert! From the Washington Square Park stop, we headed down to Soho and got off at the Canal Street stop. But before we got off the bus, I had to take a photo of this hilarious safety reminder. Some of the traffic lights are really low and this sign speaks the truth. I stayed seated at all times since I didn’t want to get decapitated. At the Canal Street stop, which is in Chinatown, we walked about a block to Canal Street Market where we had this icy treat. 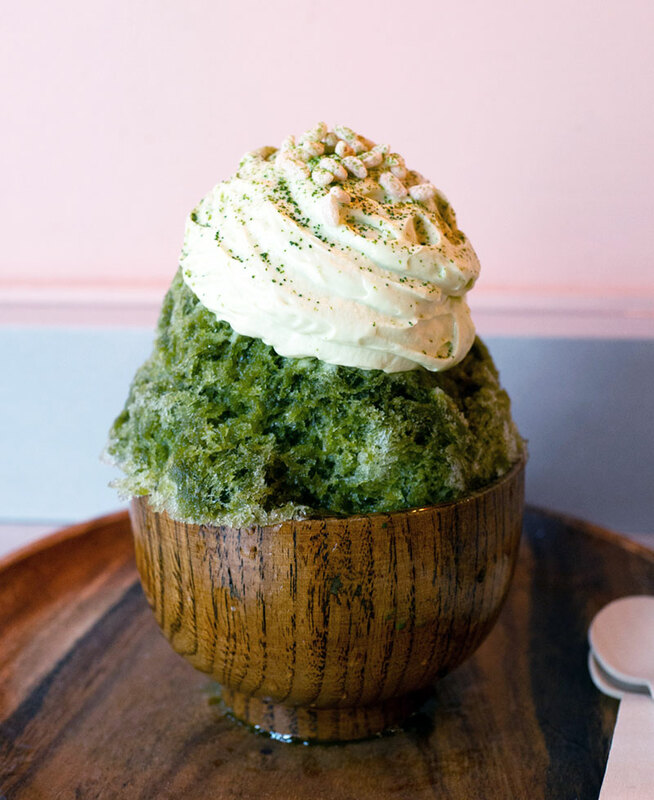 Inside the Canal Street Market is Bonsai Kakigori, a place that specializes in Japanese shaved ice. Of course Queenie and I got the matcha shaved ice. It was a little hot that day so the shaved ice was perfect. We shared one and it was gone in 2 seconds. 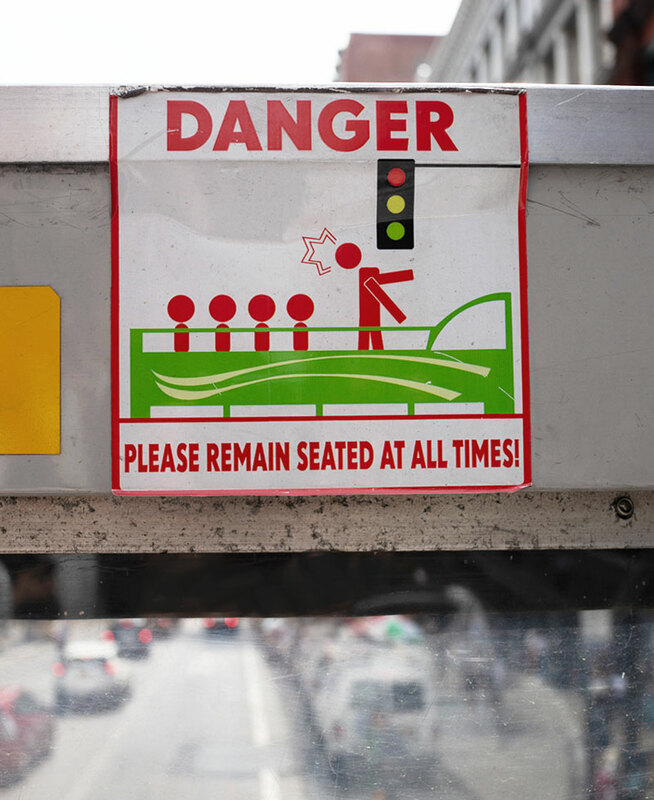 Speaking of low traffic lights (AKA decapitation machines), check out this low hanging sign with stickers could only be stuck on from a double decker bus. Getting back on from the Canal Street stop, I was so full that I may have just shut my eyes and enjoyed the ride, wishing they had hammocks to lie in. Oh, a girl can only dream. 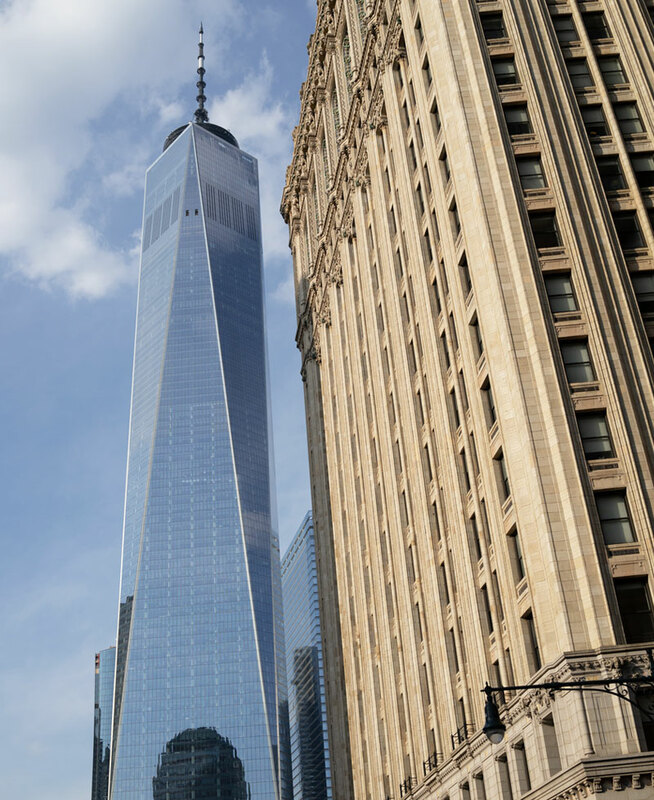 The bus loops around Battery Park and heads up the West Side Highway, passing the One World Trade Center building. What’s up with those two darker windows near the top of that building? All I can see are upturned pig’s nose with nostrils. Just me? Ok, let’s move on. The last and final tea stop was at Chalait, a cafe inside Chelsea Market, right near the High Line, an elevated train line that was converted into a park. 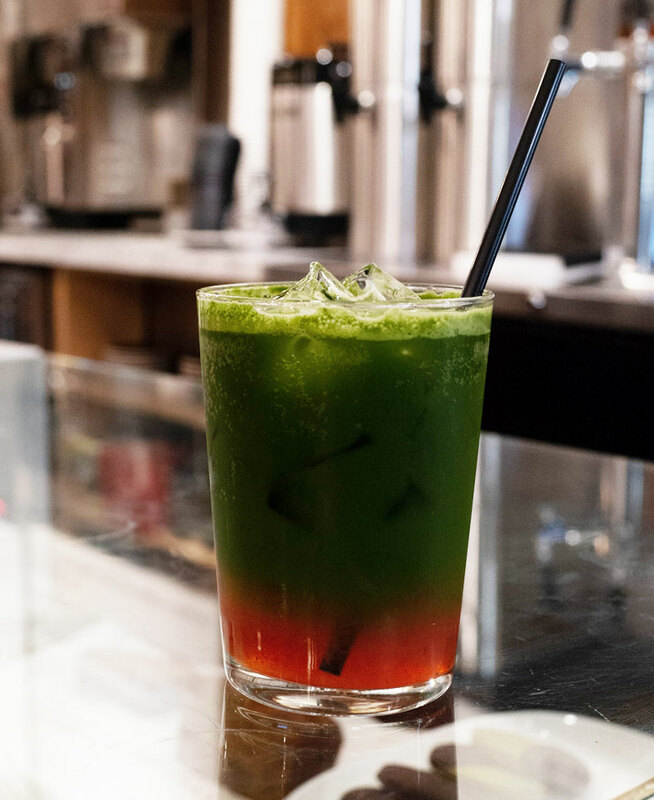 I really needed a refreshing drink and this iced Matcha Strawberry Lemonade HIT. THE. SPOT. If you’re feeling like you want to walk a bit after this stop, I highly recommend walking the High Line. Or if you’re lazy, get back on the bus and head back to its final destination at the Port Authority. Ours with all the stops was a 5-hour tour but if you don’t hop on and off, it’ll take about 2 – 2.5 hours. 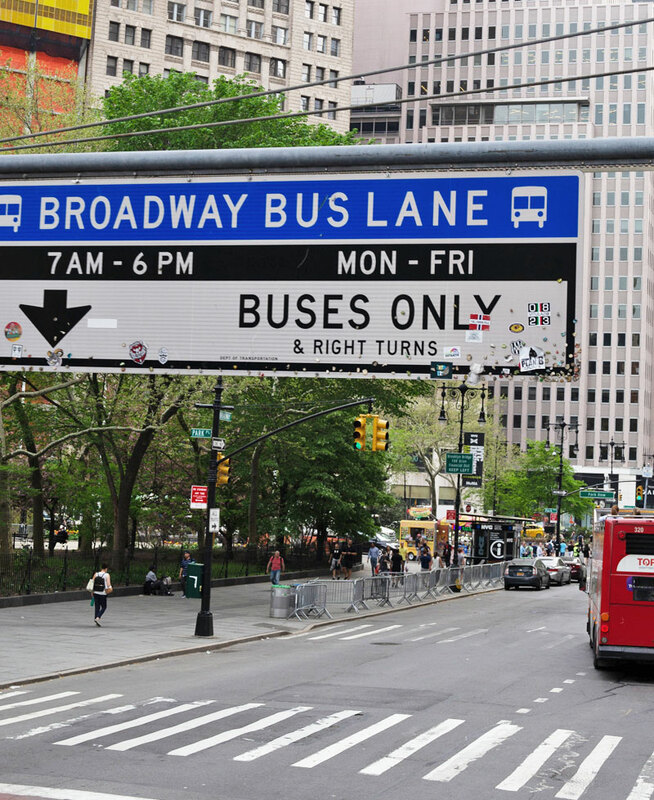 After riding the double decker bus for a few hours, you will notice a nice thick layer of NYC grime on your skin. This is normal. Just wash with soapy water and you’ll be good to go on another double decker bus ride the next day! Rinse and repeat. In collaboration with TopView Sightseeing. All words and opinions are mine, as always.